The Northfield Planning Commission took a little look at Tiny Houses back in January, but the city really needs to build tiny houses into the much bigger picture of housing in Northfield. The City should not try to guess why people may choose to live in or build a Tiny House; there is no compelling government interest I can identify which requires regulating this. houses built on permanent foundations and connected to sewer, water, etc. Decide whether Tiny Houses should be tightly regulated and allowed in a very limited way (if at all) or whether Tiny Houses are a housing choice which should be broadly available to anyone who chooses this type of dwelling (or chooses to build them to sell to others) and craft regulations which are simple and easy to navigate. Right now, Tiny Houses are a problem because they cut across categories of regulations. Whether on wheels or permanent foundations, there is no regulatory place for Tiny Houses in Northfield. 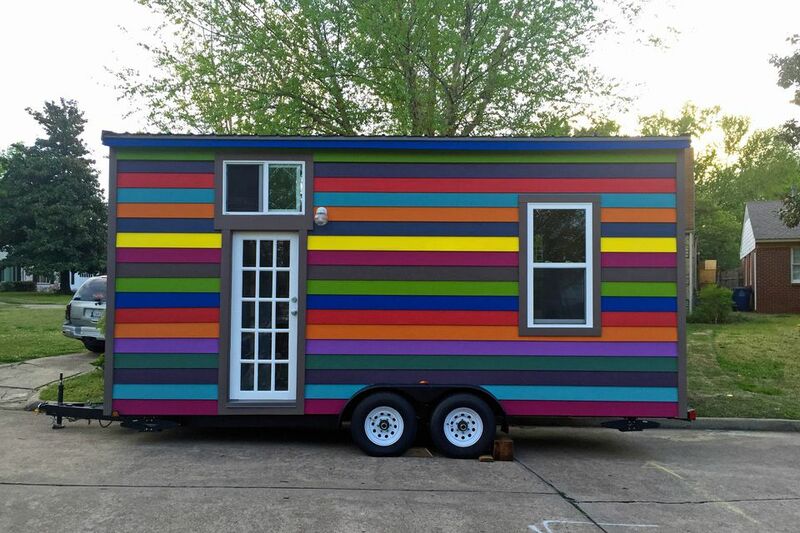 Tiny Houses On Wheels are not manufactured homes which must be located in the R4 zone, but are somewhat more like transient dwellings “designed to be regularly moved on wheels” like campers or motor homes which can be licensed to be parked and occupied for no more than 30 days. Or, something more like the Temporary Family Health Care Dwelling without the use requirements about family and healthcare. 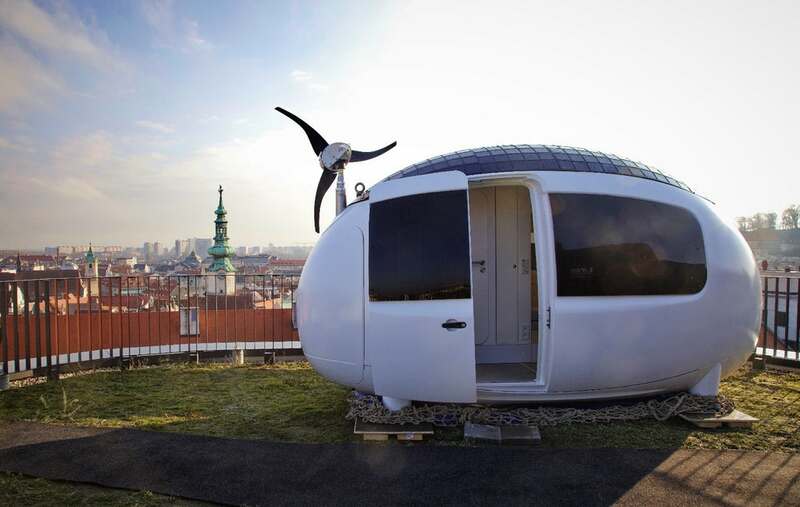 I’m going to suggest we could license Tiny Homes on Wheels in flexible ways to ensure some accountability in time limits and location for a mobile dwelling, plus health and safety items without (like the granny pods) stipulating the reasons people might want to live in a Tiny House on Wheels. Tiny Houses on Foundations are permanent, but are they primary or accessory dwelling units? As primary dwellings, their small size does not fit well with typical lot sizes and setbacks in residential areas (nor could two primary dwellings be on the same lot), would run afoul of the neighborhood compatibility rules for the R1 older areas, and we do not currently have a location where a cottage court or Tiny Subdivision with appropriately sized lots (or multiple dwellings on the same lot or small lots with shared common space) could be located. As accessory dwellings they are not permitted anywhere in Northfield, since the only accessory dwellings allowed are as part of detached garages. 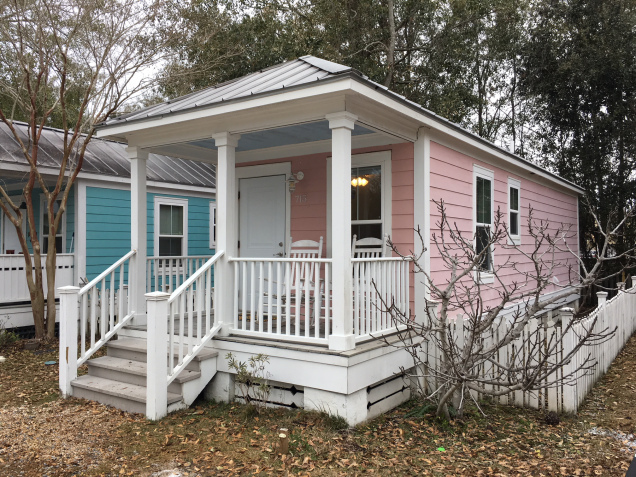 The first stab at Tiny House regulation in the proposal presented to the Planning Commission is to add Tiny Houses as primary dwellings to the N2 Residential zoning district. 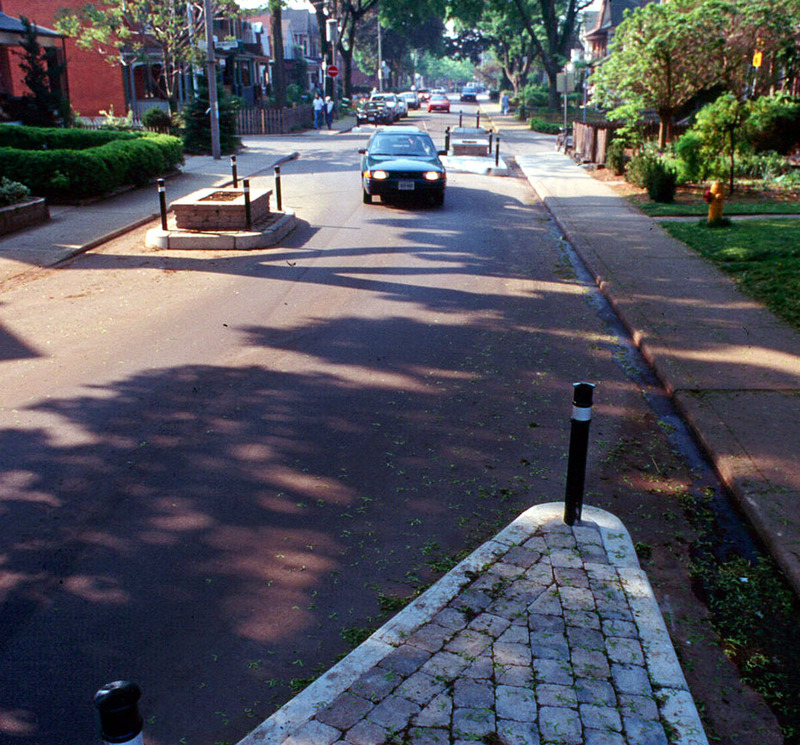 The N2 district will create a pedestrian-friendly environment, such as found in the R1 district, with strong neighborhood qualities, such as a grid-like street pattern, consistent block size, compact development, a range of housing types and architectural styles, street connectivity, sidewalks, and homes located in close relationship to the street. This purpose statement suggests Tiny Homes as primary dwellings would be appropriate as part of that range of housing types and compact development. 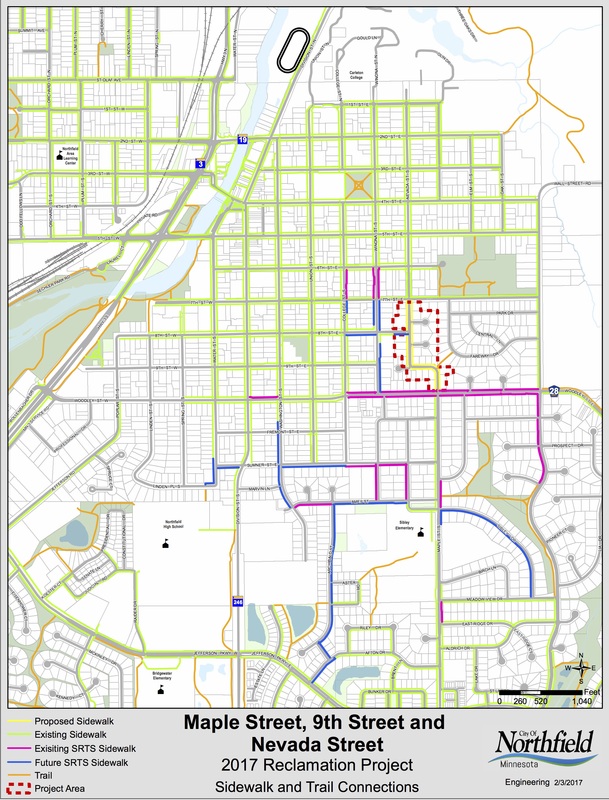 N2 areas are currently undeveloped, so there is no conflict with neighborhood compatibility standards or, more important, no conflict with existing neighbors of R1 (the older areas near Carleton and St. Olaf). This strategy is politically and technically easy; dropping a new column of small-scale site design into the code to be applied to as yet unplatted land provides for one place to build Tiny Houses or Tiny Subdivisions. This proposal is promising, but very limited. Following the guidance of the Comprehensive Plan and Strategic Plan which call for creating more affordable housing, workforce housing, senior housing, a range of housing types, more intensive development and removing regulatory barriers to building affordable housing. 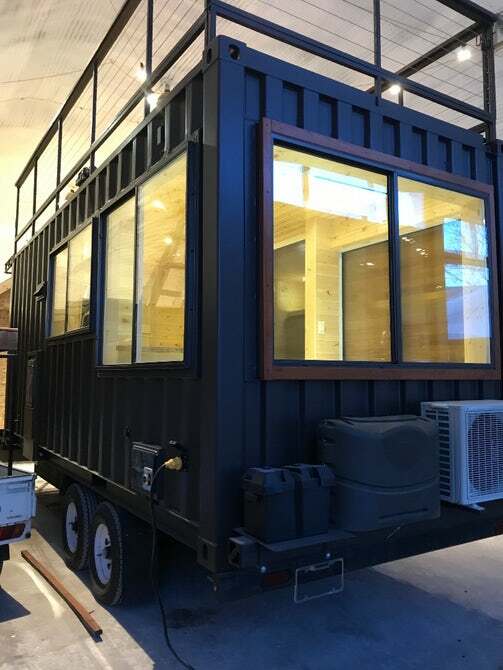 I’d call allowing Tiny Houses in Northfield an opportunity to add another tool to the housing toolbox which can be affordable, environmentally sustainable, and flexible for many types of residents. In all low-density, primarily single-family zoning districts; these would include R1-B (older, grid-street neighborhoods near downtown), N1-B (most newer single family home areas), and N2-B (the undeveloped land to be more “R1-B-like”) where Tiny Houses would offer one way to add housing incrementally in older, desirable and well-connected neighborhoods, as well as planning for them in undeveloped places. So, I could build a Tiny House in my backyard in the R1-B district as an accessory dwelling unit to rent now or to move into and rent my primary dwelling if I would like to downsize or income needs change. Someone with a large or double lot could seek a minor subdivision to create a new Tiny Lot or two for Tiny Primary Houses. The HRA could build a new Tiny Subdivision in N2-B. And more, I’m sure. 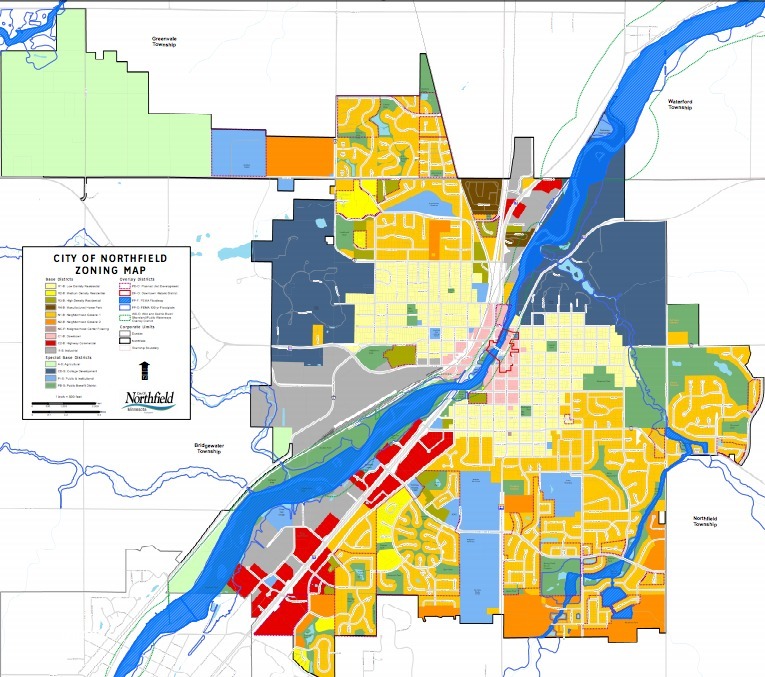 The Strategic Plan, Comprehensive Plan and Age-Friendly Northfield initiatives (AARP supports Tiny ADUs) provide plenty of policy level support for more housing choices (at more price points) and permitting and encouraging infill development. At the ordinance level, though, there’s trouble. 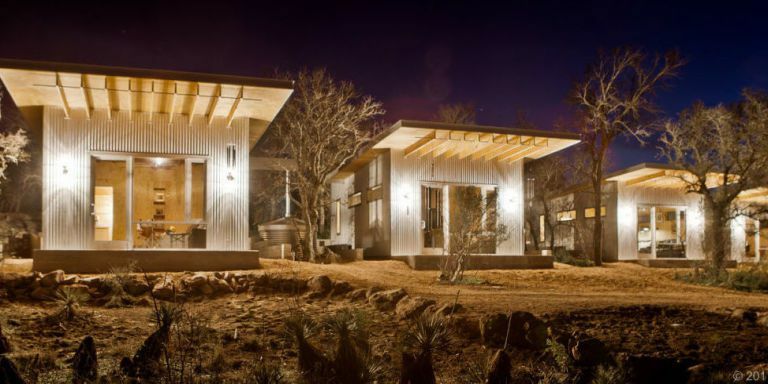 What ordinances need to be changed or eliminated to make Tiny Houses easy to build? Basics: Allowing Tiny Houses as a specific use in low-density neighborhoods and reviewing lot size and setback requirements to allow for smaller dwellings would be required. Accessory Dwellings: Currently limited to dwelling units only as part of detached garages in residential zoning districts, Northfield would need to relax those requirements to provide for freestanding ADUs (and here’s a model code which allows for a range of ADUs which would accommodate Tiny Houses well or this one). The bonus for making these changes would be to allow for a range of accessory dwellings whether on garages, attached to primary dwellings, or freestanding units. Neighborhood compatibility regulations for R1-B: In order to maintain neighborhood character, R1-B regulations include “compatibility” requirements where the “primary focus of these compatibility standards is to ensure that new infill development, redevelopment, or building expansion relates to the massing and scale of the surrounding structures.” Tiny Houses, mostly likely, would be out of scale with neighboring homes as primary dwelling units; accessory structures are exempt but ADUs are limited as noted above. I’d argue that regulations intended to preserve “character” can be code for protecting neighbors (often affluent neighbors) from what is seen as undesirable change. Parking regulations: ADUs must provide one off-street parking space in addition to the two required for each primary dwelling (so, two spaces for a single family home, four for a two-family dwelling, etc.). Requiring two spaces for each single family primary dwelling Tiny House might also be counterproductive. Rather than requiring parking, leaving this decision up to property owners would increase flexibility and possibly reduce costs. Rental code: Even if physical standards were changed, ADUs could be detached, neighborhood compatibility issues were resolved and parking was not a problem, the rental code could still be an obstacle. While the rental code exempts owner-occupied rentals (say, a rental apartment contained within the owner’s home), ADUs which are not part of the primary dwelling do not appear to be covered. The limit on rental licenses in low-density neighborhoods to 20% of the “houses” on a block measures the proportion based on a house as a “single structure containing one or more rental units.” Is a freestanding ADU Tiny House counted as a “house?”As with neighborhood compatibility standards, the rental code is another attempt to preserve neighborhood character in ways which discriminate against renters as “people not like us” in higher income neighborhoods (students, for example, or lower income families). Northfield city staff are already looking at this; the staff report addressing Tiny Houses states “Northfield staff are currently investigating changes to the rental ordinance as part of the strategic plan objectives on affordable housing. The current feeling is that instead of introducing Tiny Houses into the mix, Northfield might be better served by modifying the existing ADU standards to allow ground level development as part of a garage or as a free standing unit. We are also evaluating the impact of the rental ordinance on the Northfield housing market.” Indeed. So Northfield, read the Plans and policies which call for more housing choices and really consider how to help Tiny Houses be one of those choices without fear of what the neighbors will say. YIMBY! I just completed the Northfield Community Survey and you should, too. The survey is the mechanism by which the Council and city staff collect information from The Public (boards and commissions having had their own meetings) to inform their strategic planning process. After I stopped sputtering with irritation about the questions which asked for gut-level answers to complex questions for which no education nor guidance was provided – indeed, the stunningly unstrategic nature of the exercise – I answered the questions. Here’s how I’d really answer them if I’d been given something beyond multiple choice. 1. 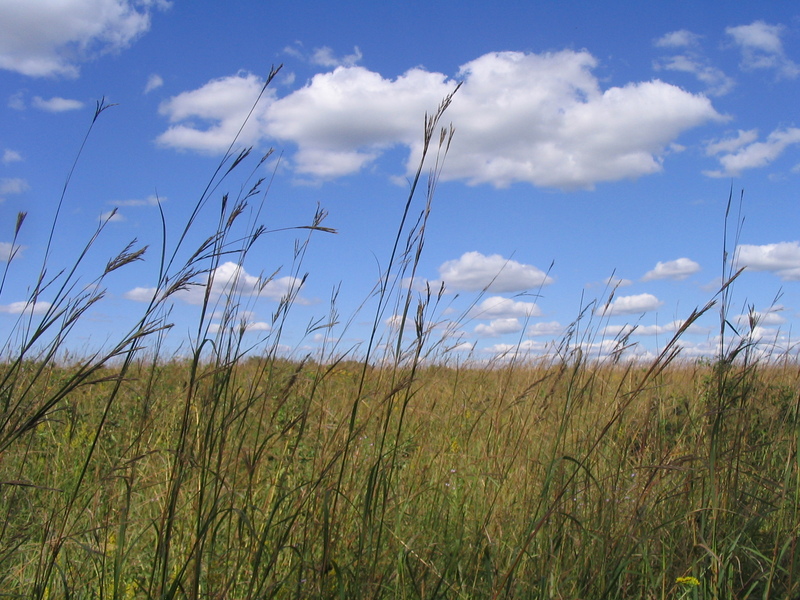 Please tell us why you live in or have moved to Northfield: OK, this one’s easy. I moved to Northfield so my husband could teach at Carleton College (translation: I’m white, privileged, highly educated, and affluent. I’ll thrive regardless of what Northfield does. 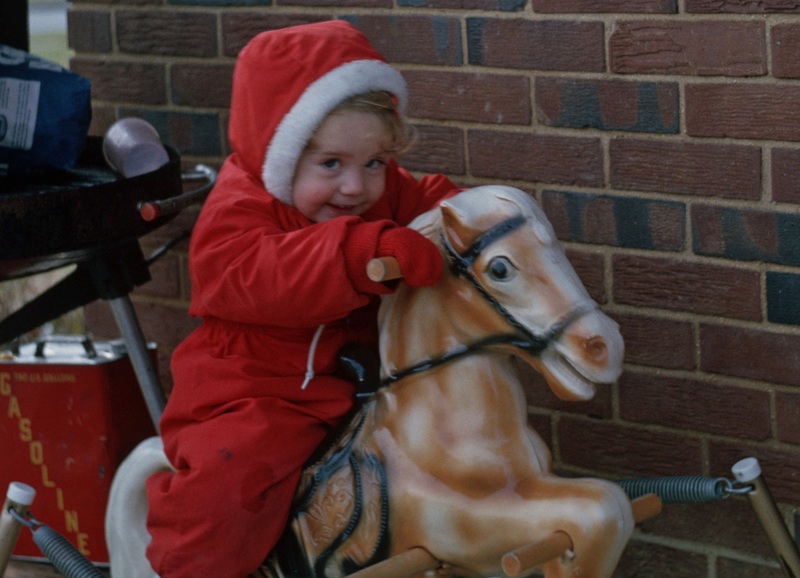 Most people presume I’m on the bleeding edge of liberal politics). 2. Low taxes are important to a community’s success. Taxes which are equitable, sufficient to fund the services residents need and want, and educated policy-makers who understand the relation between taxes, development patterns, and long-term costs are critical to a community’s sustainable success. Educating taxpayers about the city tax structure is important, too, for when I get my tax bill from Rice County, the $3000+ amount for my property includes county, school district, and city taxes (including special taxing authorities like the EDA and HRA plus any special assessments on my property for infrastructure costs); I pay less than half of the total amount to the City of Northfield. Educating taxpayers about the tradeoffs required for low taxes is also needed. 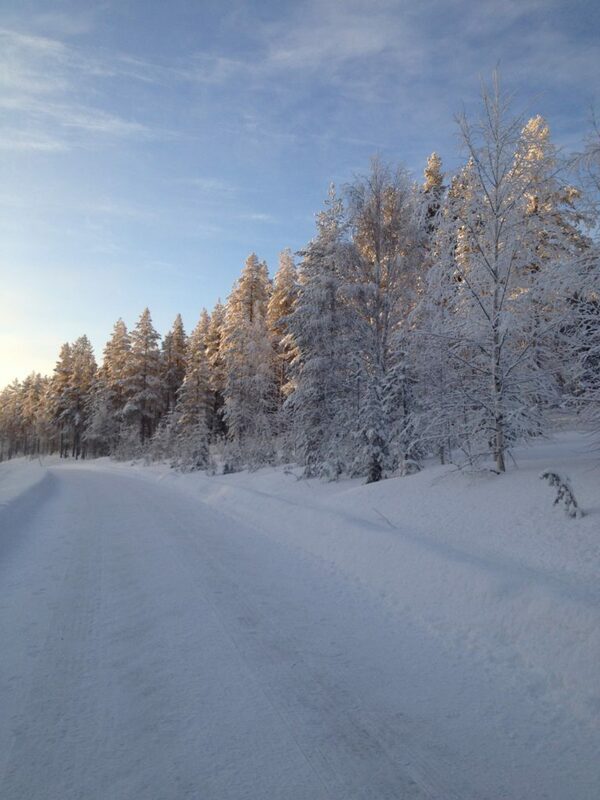 It is not possible to have low taxes, high services, and great pavement. Working with the school district to build facilities which help cut costs and integrate services is also needed. Utilities: Water (drinking), wastewater (flushing), stormwater (street/property runoff), garbage (landfill), and recycling are mostly paid for by user fees (plus bonding for capital improvements which gets rolled into fees). The water is clean and drinkable (a public health benefit not to be underestimated) and the other utilities are ok, but my assessment of quality and price includes whether the City is working to reduce stormwater runoff, reducing solid waste, and encouraging energy conservation. Since I care about streets, I’m concerned that the city is barely discussing conservation and environmental sustainability and not connecting stormwater with city standards for streets. 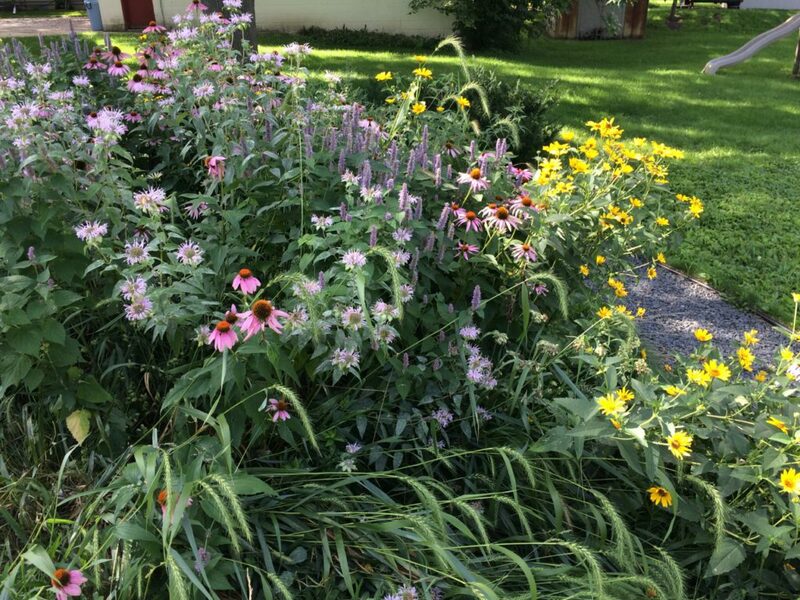 Growth, development and services: The strategic question for the city – what is Northfield doing to manage water, wastewater, garbage collection, and stormwater in order to both sustain the environment, but also keep costs down? What is Northfield doing to reduce solid waste (and landfill costs), conserve water (reducing stress on aquifers), reduce runoff, and manage wastewater (new sewage treatment plant was on the horizon, but how and where we build also makes sewage easier or harder to get to said plant). Is the city scoring its development proposals for the amount of infrastructure required and the likely ability of tax dollars and fees to pay for that expense? 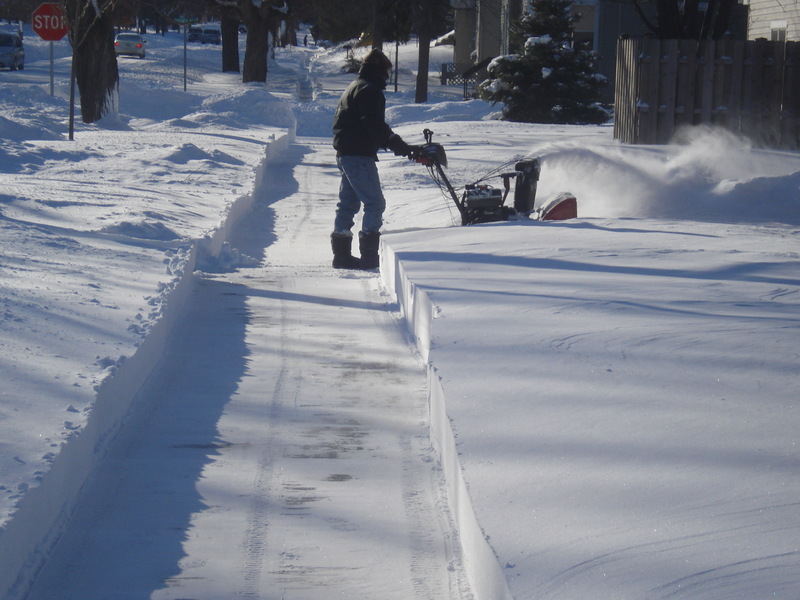 Other services: Library, parks, snowplowing, street-sweeping, police and fire, swimming pool and ice arena are general fund dollars. Some strategic partnerships help with parks (sports associations help manage fields, build trails, and do maintenance), library (the Friends and Foundation of the NPL raised much money to support the library expansion project as well as on-going library needs), the fire joint powers agreement is another way to share costs. The strategic question is how will we fund the services we want? The liberal, common-good model would provide more tax funding to the library, for example (so, see the question above about whether low taxes are the goal) while the conservative answer would be to privatize more (and then ask how this helps address poverty and inequity in town). 5. 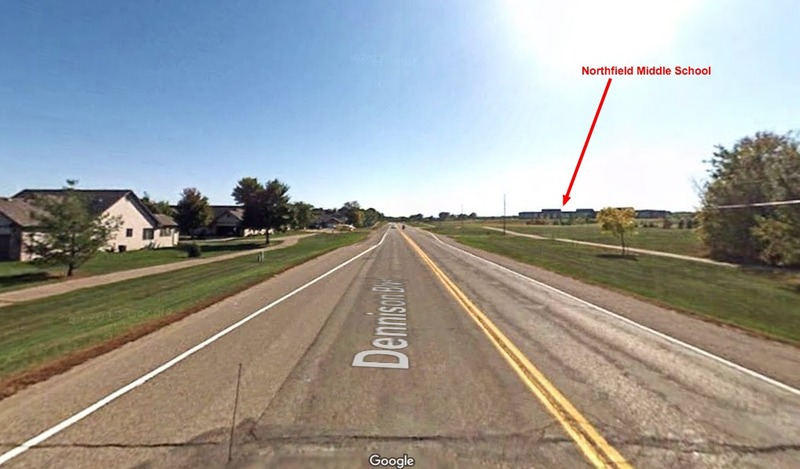 There are not adequate housing choices in the community: Northfield has built many acres of single family, market-rate homes on large lots and wide streets (and some have celebrated the growth in the tax base and creation of jobs as a result). Building smaller and building denser (and more affordably) is much more difficult and the private developers have mostly stayed away. So, the strategic question is: how can Northfield ensure a range of housing choices? Northfield can build more affordable housing (through the HRA, for example) using tax dollars and grants (often tax-funded at another level of government). Northfield can also revise its regulations away from minimum lot sizes and single-family only development with carefully segregated multi-family housing to encourage incremental development, adding density in existing neighborhoods, and removing obstacles to small-scale private development. How will Northfield address NIMBY-ism which argues against density or change? 6. We should do more to address poverty in Northfield. See the questions above and below, but provide information about the scope of the problem, what is within the City’s portfolio and tell us how city government, other levels of government, and the non-profit sector can work together. City government can work on certain slices of the poverty issue, but needs to network. 7. The City should place more emphasis in creating jobs and business growth. I think I have already said what i need to say about this one here (Business Park and infrastructure costs), here (economic gardening vs. business subsidies), here (black swans and resilience) and here (development pattern and costs). When I look at recent development, it’s not the big subsidy stuff nor the very fringe of town stuff – look at Vet Provisions/Aurora Pharmaceuticals (some JOBZ funding there, as I recall), Armory redevelopment (housing, community space, and brewery); new hotel and Tanzenwald Brewery on or near the Crossing (plus Brick Oven Bakery moving here), Content Bookstore, infill around Target (Maurice’s, Dollar Tree, Fielder’s Choice, YMCA), and out by the hospital satellite (Mayo radiation clinic). I see new business which builds on the attractiveness of Northfield as a place to live and visit or exploits the proximity/synergy of existing business, not pie-in-the-cornfields development. Thinking ahead, how can Northfield get more of this (without throwing money at developers)? 8. We need a thriving downtown for Northfield to be successful. And this one, too, here (importance of downtown) and here (downtown development is not just for liberals, but makes conservatives happy, too). And more parking is not the answer. 9. The City parks provide amenities, greenspace, and recreation that are quite generous: For a city its size, Northfield has lots of parks and lots of kinds of parks. The strategic question is – do our parks serve all our residents? I’d add other questions like: is it easy and safe to walk and bike to parks (rather than presuming we can all drive to the park we want to visit)? Do parks feel safe? 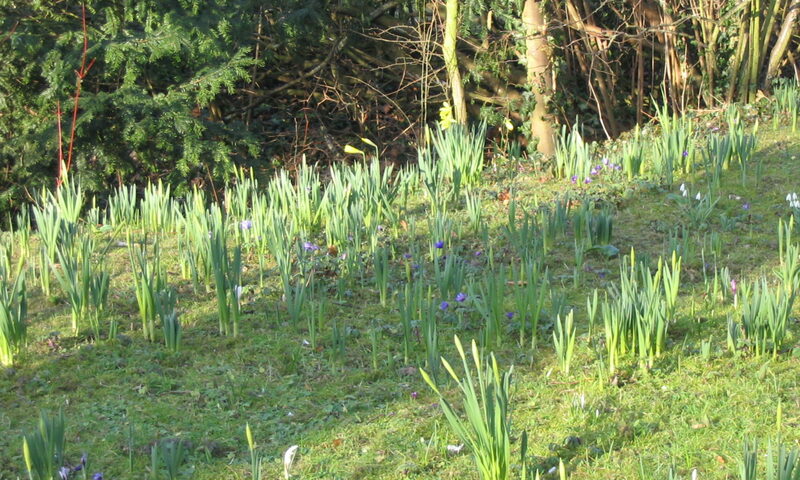 Are parks maintained in environmentally sustainable ways? 10. The surface conditions of the streets in the City range from good to horrible. 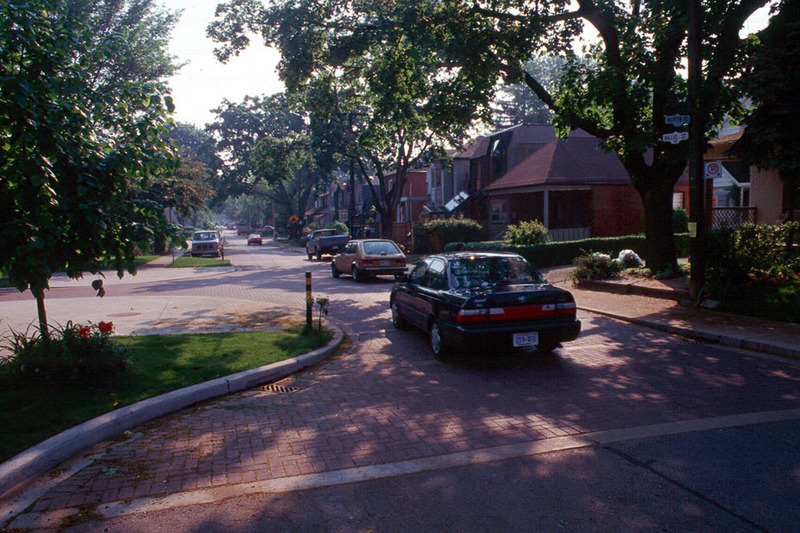 Short-termism 15 years ago lead to budget cutting by delaying street maintenance which, very quickly, was shown to snowball with more streets deteriorating and making it very expensive to play catch-up. The strategic question is: how does Northfield look at its street network and how well it connects the city and, if it chooses to continue to build wide streets with low density development, who will pay for the maintenance…or, how does the City encourage building more compactly to make better use of its streets (with more taxpayers to fewer miles to help pay)prioritize routes). Asking about whether special assessments are the best way to pay for street repairs is another worthy question to ask. In specific locations such as around Central Park right now, how does the City ask the Colleges to pay for the wear and tear of construction equipment on city streets? 11. What is your preferred form of media used to receive City of Northfield news and announcements? A really good website. The latest revamp is slightly, but only slightly better. But, really, don’t worry about me because I’ll find the information I want because I’m educated, connected to the internet, know my way around City Hall, etc. 12. Northfield should place more emphasis on communication effort to improve public information on City services and activities. Obviously, I think the City needs to do a great deal more to help residents know how city government works, what it costs, and how various policies interact to be more or less sustainable. First, I think the Council should educate themselves, seek better experts to advise on projects, and then use multiple channels to take information to Northfielders and ask for their feedback. This survey was a example of how not to do it. 13. What do you like best about Northfield? On a daily basis, downtown and the Carleton Arb (for those who say colleges are a drain on the economy because they pay no taxes, I’d say they add much in cultural offerings, education for high school students, open space for study and recreation, the renewable resource of students who come, thrive and help informally market Northfield, and being high-quality employers). 17. What are/should be the top priorities for the City over the next 3-5 years? Already wrote that one here. 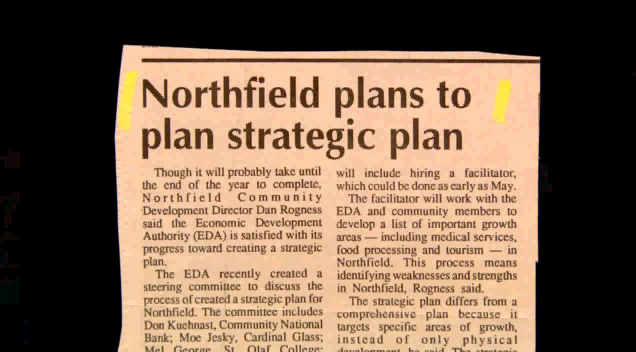 The late Dixon Bond once observed to me: “Northfield has a tendency to over-plan.” So when the EDA, Planning Commission and City Council meet in a worksession tonight (04/11/2017) to do some (carefully orchestrated, consultant-driven) strategic planning, I will try to be optimistic that this planning effort will lead to action, rather than simply more plans. Implement the policies already adopted by developing the regulations and funding streams to do so with particular emphasis on linking land use, transportation, sustainability, and building equity in city decision-making (or develop a specific plan for updating or replacing policies believed to be outdated or inappropriate). 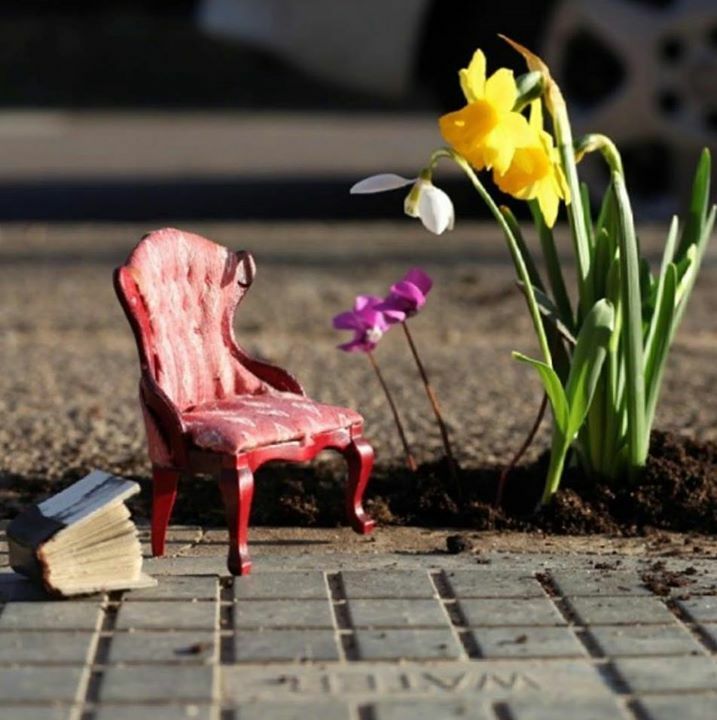 Adopt street design standards which will guide planning and design of projects beyond vehicular measures of Level of Service and Functional Classification to create streets which connect people and places and are sustainable. Plan a network of low stress bike/walk connections and commit funding with particular attention to connecting important places and designing intersections for people outside of cars. Recent conversations about 246/Jefferson that a roundabout “is safe” reflect only crash statistics, but not how safe if feels; plan for making connections convenient and appealing to vulnerable users. 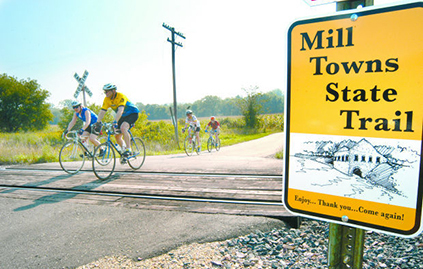 Prioritize completion of the Mill Towns State Trail by adopting the revised route from the Prowe Pedestrian Bridge, along Jefferson Parkway and out of town, collaborating with the DNR, Carleton and other entities to finish the Northfield segment as soon as possible. Trails help connect the city for the people who live here, as well as bringing many to town to ride and spend. 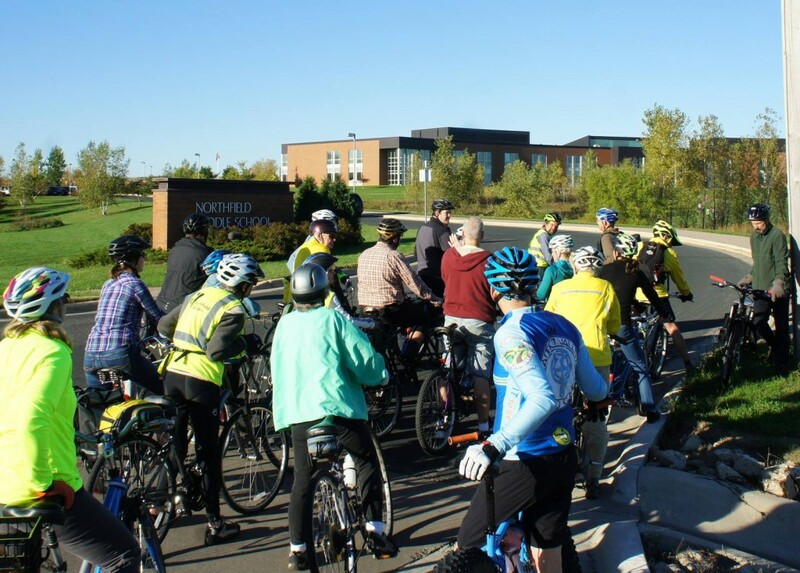 Collaborate with the Northfield School District to really connect the southern schools, reduce traffic demand, and increase walking and biking. I think “collaborate” should extend to funding, for the schools created the traffic and will benefit from solutions. Housing, affordable and denser: In the early 2000s, Northfield built many acres of market rate, single family homes, but these large lot, 3-car garage sort of houses are not affordable for many nor desirable for some of us and this pattern of development demands much more expensive infrastructure, impedes walkability, and creates income ghettos (see equity below).The Comp Plan principle of more housing choices can be approached by allowing (and encouraging) greater density in existing neighborhoods by getting rid of some of the recent regulations. 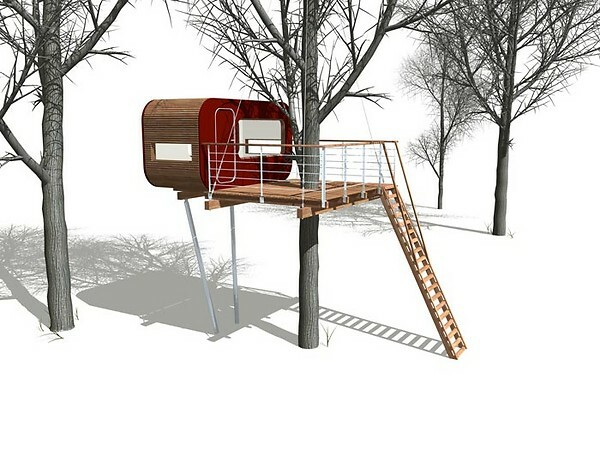 Accessory dwelling units: Repeal Northfield’s over-specific regulations such as the current accessory dwelling unit regulations (must be part of a detached garage among other things), “granny pods” and the rental code. A better strategic priority would be to make it easier for property owners to add accessory dwelling units which meet their needs and market needs (caring for relatives, investment rental property, constraints of the property itself). “Missing middle” housing in existing older neighborhoods should be encouraged (see small scale, incremental below). Score development proposals based on fiscal productivity to determine whether the private tax value generated will be sufficient to support (and replace) the public infrastructure expenditure. The NW business park is the sort of development which screamed for this sort of analysis, but the same process should be applied to new residential development, too, to take a longer term look at the benefits and liabilities of new projects justified as economic development. Simply repeating “Grows jobs and tax base” without doing some of the math is superstition of the highest order. Encourage small scale, incremental development. Current regulations favor big developers and large projects; Northfield should focus on welcoming and enabling incremental development. 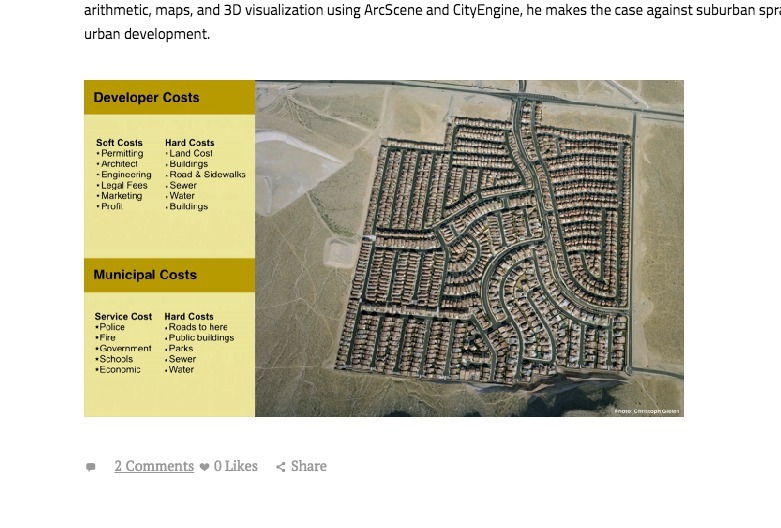 For inspiration, take a look at Lean Urbanism and the Incremental Development Alliance. Consider in a deep and intentional way how the City can learn from the people who live here as well as informing us about city plans and projects. “Asking the same 12 people to come to a meeting on a Thursday night is not the most effective plan…Instead of asking, ‘Who’s not at the table?’ we try to ask, ‘Whose table are we not at?’” Right now, I’d argue, Northfield City government mostly waits for people to come to its table (which is set for 6 pm on a weeknight at City Hall). Finally, not so much a priority as an exhortation – please do not govern by referendum or public hearing, but as informed representatives who weigh the data, the public comments (which you have worked hard to solicit from a broad range of the community), the budget, and make equitable decisions for the common good of Northfield. Please help residents learn about where the money comes from and where it goes, educate Northfield about possibilities rather than playing to fears, hire the best staff and consultants, and use real data to make decisions rather than voting by gut instinct and who shouts the loudest. Challenge yourselves to learn enough to make equitable, sustainable decisions for the rest of us. First, thanks to Northfield for starting to plan how to rethink and redesign this intersection (and thanks to continued pressure from residents and the 246 Solutions group for helping move this along). Let’s seize this once in a generation opportunity to reconnect our places by designing this area to improve the safety, walkability, and bike access to schools, community facilities, and neighborhoods. The opportunity is even more golden than it was even a year ago as the School District is considering building a new high school closer to this intersection and the Mill Towns Trail is planned to be routed along Jefferson Parkway from the Peggy Prowe Pedestrian Bridge to Spring Creek Road (creating an off-road link to CROCT‘s MTB trails in Sechler Park and the the new East Cannon River Trail). My past commentary: I’ve already had much (critical) to say about this intersection and the history of planning decisions which have put much pressure on this link. From choices made when planning the Middle School (Schools and where to put them) to more recent efforts to improve safety (Still Not a Safe Route to School), to looking to change the conversation about streets from vehicle traffic to community connections (Reimagining Woodley), I’ve been talking about this for a long time. Now that the City is moving forward, let’s think how to help the City make good choices to help us get where we want to go. 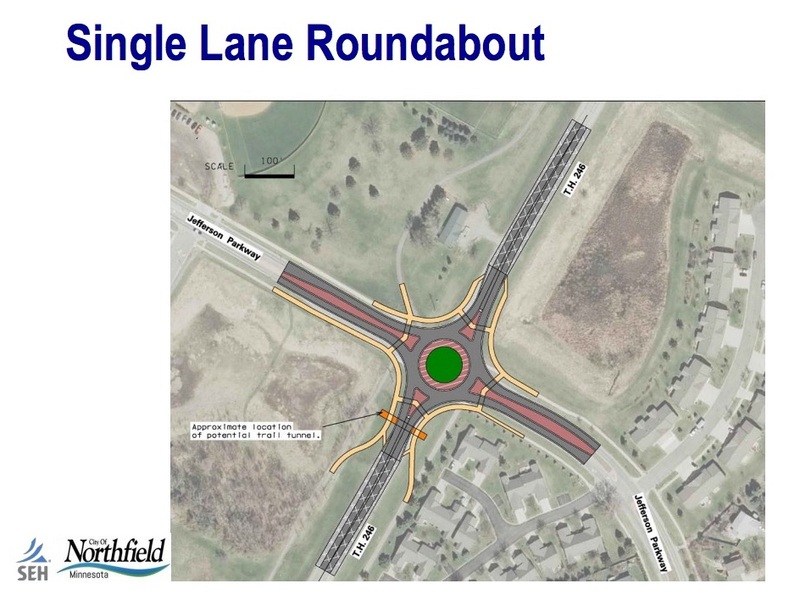 Roundabout recommendation: SEH’s study has recommends a single lane roundabout. When the recommendations were presented at an open house in December, the roundabout was not considered a poor choice, but the people at the meeting were concerned there was still no significant discussion of how to help young people walk or bike to school, how people could easily reach the NCRC, how the Mill Towns Trail would work, or how other improvements near the intersection could be added (such as a safe crossing to the high school), or how improving this intersection for walking and biking could reduce the school-related vehicle traffic. The issue is bigger than the intersection: SEH (to their credit) and community members at the open house understand the scope needs to expand from from just the intersection (a critical piece to be sure) to help all Northfield residents (of all ages and abilities, as our Complete Streets policy states) reach important places however they choose to travel, (whether driving, walking, riding a bike, or transit) requires thinking about the surrounding area, connecting streets, and the important places. Northfield needs to better connect people and places: SEH’s report has some good recommendations, but does not go far enough to address the human transportation needs in the south part of the city where so many important facilities are located. Take time to get it right: The letter asks Northfield “to more fully consider the opportunities for safely serving this area” before immediately adopting the recommendations (but also proposing some short term, cheap solutions to improve safety quickly and sustain momentum for change. 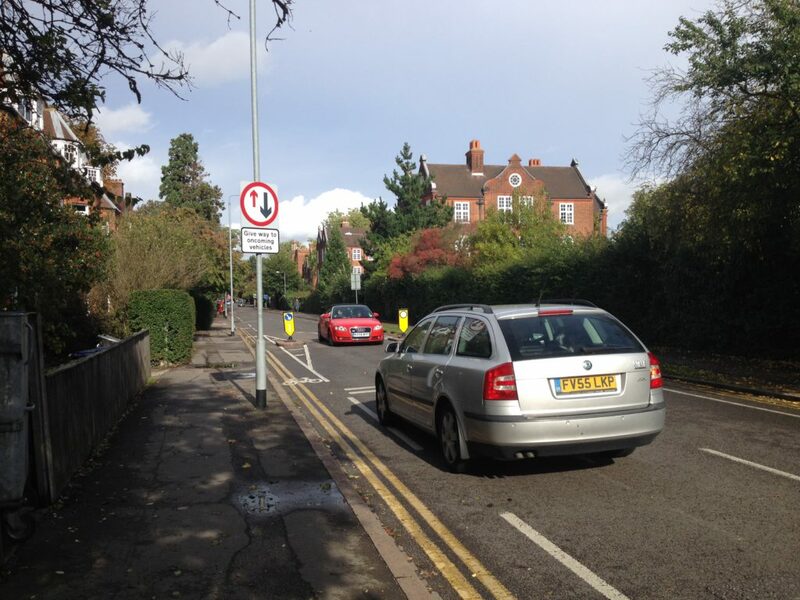 Reducing vehicle traffic: The SEH report does not consider how to reduce vehicle congestion caused by school traffic by designing for safe, convenient and pleasant biking and walking. Years of development choices, fewer parents at home, and helicopter parenting have contributed to the steep decline in walking and biking to school. Usually not mentioned is that much of the traffic to the schools is generated by parents chauffeuring their children to school. So, rather than accepting traffic projections at face value ask how this projected increase might be reduced. 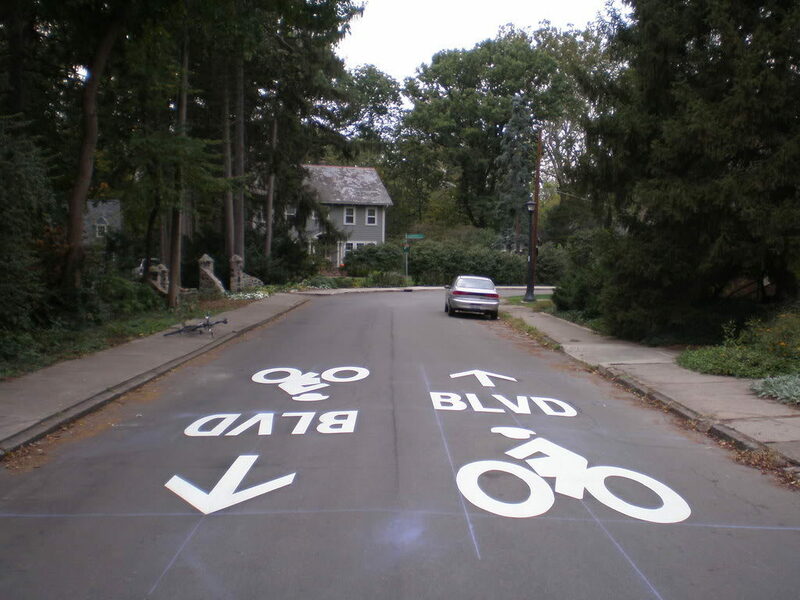 Slowing traffic by design: Speed limit signs, even the speed feedback signs, must be enforced to be effective. Redesigning the intersection (and the street corridor) to cue drivers to slow down, look for people walking and biking, and (most importantly) pay attention can make the street “self-enforcing.” Pursuing state of the art designing walking, biking, wheelchair rolling, and transit into the roadway rather than trying to add these “amenities” later will make a safer, slower, stickier street. 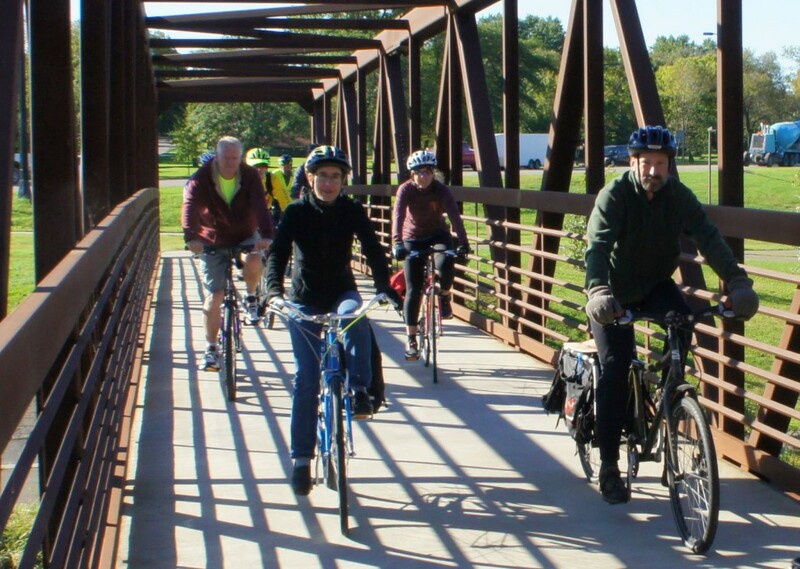 Articulating costs and benefits to capture the long term benefits and cost savings of increasing walking and biking rather than just the short term price tag. A project with bike lanes (for example) might cost more initially, but what benefits can be realized as a result? Reducing vehicle traffic (preserving the road surface and reducing the need for expansion), increasing walking and biking (saving on busing to schools), saving lives (over dollars), adding transportation choices, improving the environment and public health…how can the Council begin to think about community benefits and project sustainability, rather than just initial cost? 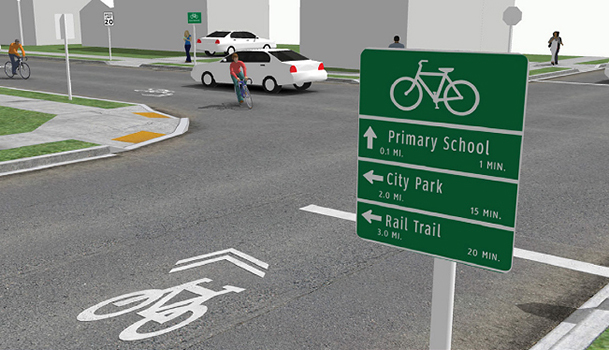 How can the Council, staff, and public learn about the full range of choices and design options to slow traffic, improve walking and biking, and link land uses? 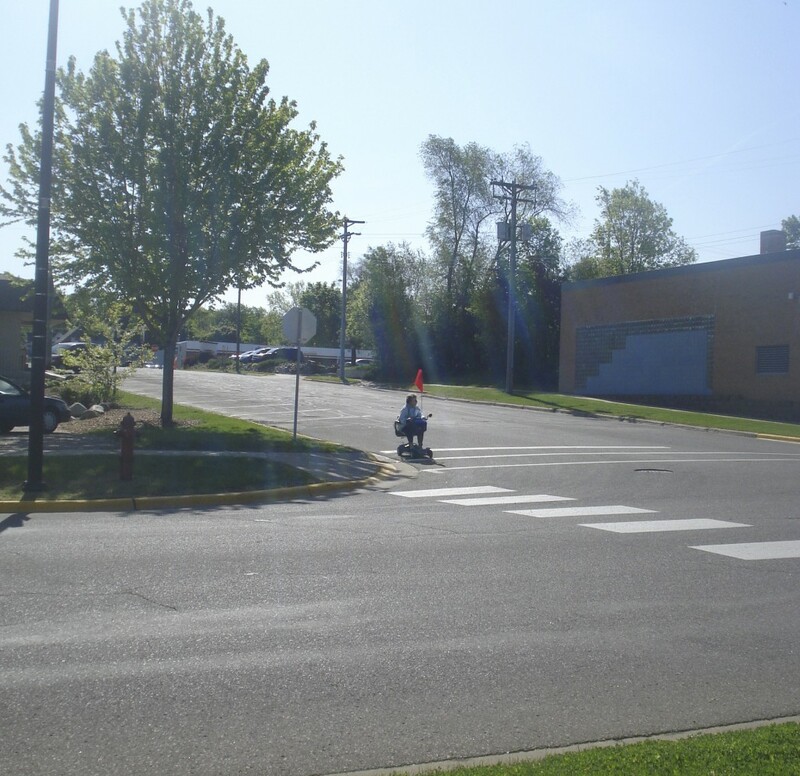 Our Complete Streets policy has high aspirations, “to ensure all streets within the City are planned, funded, designed, constructed, operated and maintained to safely accommodate users of all ages and abilities” but how can City officials and the public learn more about how to do this? Collaboration: .With the prospect of a new high school in this area, how can the City and school district work together to site the new school to reduce traffic, encourage walking and biking, and help community and school priorities work together? Smart siting can help save money on busing, improve air quality near schools, and help kids arrive ready to learn. connect the new school to its surroundings. built the schools with worries but no action for managing traffic and no discussion of non-vehicle access; what’s their responsibility for action/funding? Plus, 246 is a state highway, so working with MnDOT to develop a solution which services Northfield’s local needs as well as regional transportation objectives is critical. Again, thanks Northfield for starting working on this critical link in connecting our community! 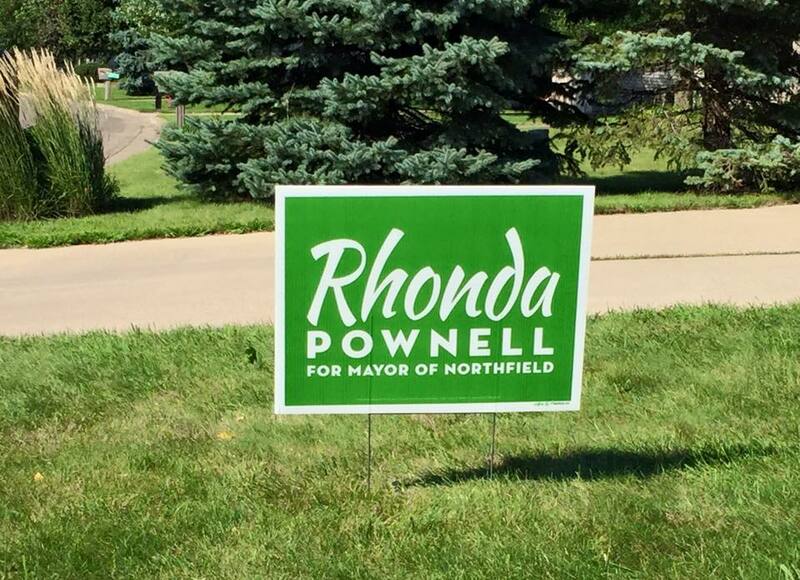 The choice for Mayor this year is both clear and critically important: Rhonda Pownell is the person Northfield needs to lead the Council and the City forward. We live in an excellent town, and we are stronger for our diversity and for our commitment to collaboration. 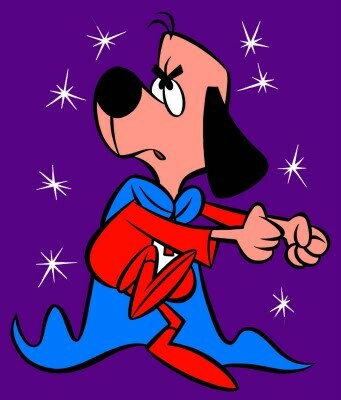 But these strengths have not been reflected in our City leadership. Each week, we seem to reach a new low in the quality of our discourse, in our inability to work together. This is a very respectful way of identifying the failure of our current mayor Dana Graham to lead the Council in an inclusive and effective way. Perhaps you have heard “The Council is dysfunctional”? Council watchers know “the Council” is not dysfunctional at all, but Mr Graham’s “leadership” of attacking those who disagree, encouraging divisiveness and attempting to silence opposition impedes decision making, repels citizens, and frustrates staff. I also worked with Mayor Graham when I chaired the Planning Commission and he served on the Council; I am deeply disappointed that he has failed to learn from his experience as on the Council or as Mayor to lead the City in positive ways. New leadership – especially the sort of leadership Rhonda brings – is critical for Northfield’s long-term success. Assertive, calm and respectful: Rhonda has not only advocated for civility and respectful leadership since she was first seated on the Council, but she has modeled this strength since the beginning. After losing to Mayor Graham in the last mayoral election and being insulted, interrupted, and ignored by the Mayor and some Council members, she has become more assertive, too, calmly reminding the Mayor of the facts of previous decisions, respectfully disputing misleading interpretations and showing her command of the issues as well as her control of her behavior. Effective and persistent: Much work on the Council happens without fanfare or handwaving, but by listening to constituents and organizations to set priorities, by persisting until information is gathered, by asking staff to bring information to public meetings, and by highlighting constituent issues for staff consideration and council discussion. Leadership development: Rhonda chose to serve on the Council because of her concern for Northfield, but once elected knew she needed to learn the business of the City and learn to lead. She has spent the last 8 years working with staff and the Council to understand the items on the agenda, but also continually seeking out leadership training and positions. By pursuing one opportunity after another, Rhonda is now the President of the League of Minnesota Cities Board. This position is evidence she has the respect of municipal leaders around the state and she knows the issues facing not just Northfield, but all cities, as well as having the connections to resources to address them. Dispelling a misconception: some of my liberal friends have asked “But isn’t Rhonda a conservative Christian?” Yes, she is. Rhonda is also a strong, politically moderate leader in non-partisan local government, where she will help the Council attend to the business of the City – streets, water, zoning, public safety, library – equitably and effectively. I believe we will all benefit from her commitment to service and improving the quality of life for all people in Northfield. Rhonda has a long term vision for Northfield which will is inclusive, compassionate, and prosperous; vote for Rhonda for the leader who can lead by example, by listening and by working together.